San Francisco’s Thao writes smart pop songs: catchy and unpredictable and instantly memorable. Her most recent work with The Get Down Stay Down — 2008’s We Brave Bee Stings and All and 2009’s Know Better Learn Faster — have an ability to get under your skin and stay there. Her latest album, a collaboration with Mirah, is due out on April 26th; collaboration, memorable literary moments, and the works of Grace Paley all turned up over the course of this interview. 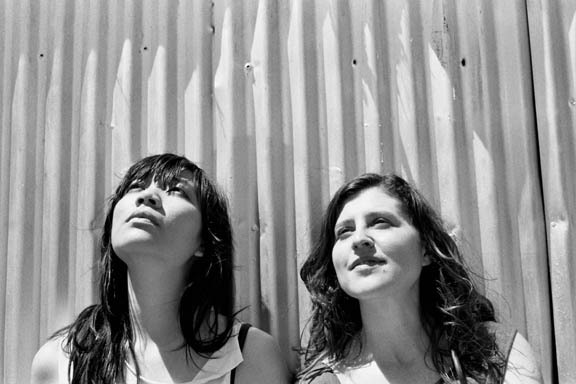 What was the songwriting process like for your collaboration with Mirah? What was the initial impetus for said collaboration? Mirah had just moved to the Bay Area and our mutual colleague/friend Lauren Ross suggested we work together. I was playing SF Noisepop and asked Mirah if she’d like to do a collaborative set with me. Months later and days before the show we learned each other’s songs very quickly. Have books — either novels or nonfiction — had any influence on you as a writer? Townie by Andre Dubus III, Nine Lives by Dan Baum. Lord of the Flies (only because the first song I ever wrote was in 8th grade-I wrote about the characters in lieu of writing a book report on it– the song was very dramatic, very heavy strumming, in A minor); all of the Choose Your Own Adventure books; Rich Man Poor Man— (I read that in middle school and I was way too young and I learned about too many adult things); The Great Gatsby; a Django Reinhardt biography, can’t remember the author.